Being at a technological forefront, UnfoldLabs believes that business and technology should go hand in hand to strengthen companies. The primary purpose of the company is to capture the growing technology trends and keep the innovation game strong. 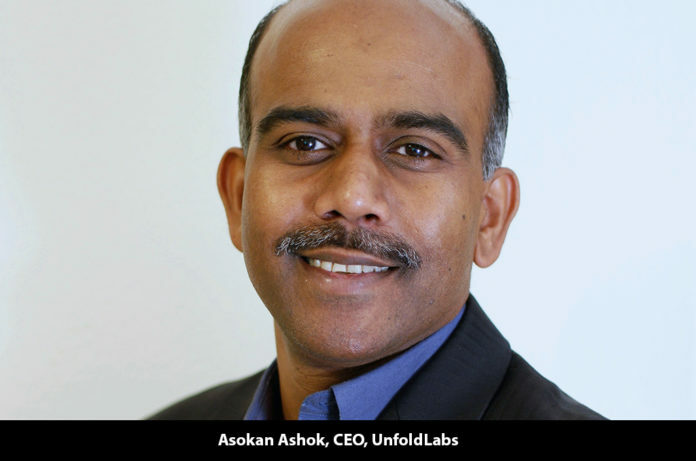 “Innovation for us means crossing, exceeding the expectations and imagination of our audience with products that they would wish to embrace,” says Asokan Ashok, CEO, UnfoldLabs. Based in San Diego, California, UnfoldLabs develops futuristic technology products & solutions to help customers overcome new challenges. The company focuses on creating strategic products on mobile and cloud platforms. With more than two decades, Ashok knows exactly what the demand is and he strategizes the development of the products accordingly. UnfoldLabs also develops customized products/solutions for their clients and believes that this combined with experience in mobility/cloud is the main strength behind company’s progress. Being a pioneer in the field, the company has no direct competition. Moreover, ease of use, simplified user experience, feedback considerations, regular product updates and releases, and the inclusion of many more features over a period of time makes UnfoldLabs products and solutions one of a kind. UnfoldLabs monitors their products with real-world analytics and user feedback to make them better with each passing day and keep them up to date. RedGreen, a one-stop shop for cleaning and boosting program for android devices was the first mobile product the company developed/launched. This innovative application helps optimize android devices. Just after three months of launch in the market, RedGreen made an impact in the list of most desirable applications and was chosen as one of the finalists for the 10th Annual Emerging Technology (E-Tech) Awards at CTIA Super Mobility 2016. MobileSwitch, an application to help transfer data from one mobile device to another was the next big launch by UnfoldLabs. It was recognized as a winner by Fierce Innovation Awards in the category of Cloud Services in 2017. UnfoldPrints, a photo printing application by UnfoldLabs, allows users to print pictures in over 8000 stores in the US and is making memories come alive for users. UnfoldPrints is also available for iOS and Android devices and allows printing to home too. 2020Applock is an application designed by UnfoldLabs to secure sensitive information of users. It enables users to secure multiple apps on their device with a password or pattern protected lock. The app is a virtual locker that protects data and applications even when the device is shared with others. 2020Wallet, is a smart wallet that helps users save their credit cards and other important documents. This revolutionary product has completely eradicated the use of the physical wallet. The e-wallet helps the user save their subscriptions and passwords as well. Talking about bringing ideation to reality, UnfoldLabs helps organizations with their expert products/solutions as well. They recently helped an innovative startup productize their ride-sharing idea right from their ideation stage to MVP in less than two months by building a custom platform. Since 2015, UnfoldLabs has been developing unparalleled products and the organization nurtures an enthusiastic and creative mindset. Thinking out of the box is the main reason behind the success of the innovation lab. UnfoldLabs has a research team, solution architects, designers and developers to create their innovative products and it ensures that the team is up to date with the latest technologies and trends in the market. To stay ahead of the curve, the employees attend webinars, technology conferences and meetups. Today, UnfoldLabs stands as one of the leading technology companies in America, receiving four awards in various fields in 2018 right from being in the top mobility companies to the most innovative firms. Aiming to have more than 150 employees in the next 2-3 years, UnfoldLabs is expanding its expertise in the field of artificial intelligence, natural language processing, predictive analytics, automotive, machine learning, precision agriculture and smart cities.